From the #1 bestselling author behind acclaimed oral histories of Saturday Night Live and ESPN comes "the most hotly anticipated book [in decades]" (Variety): James Andrew Miller's irresistible insider chronicle of the modern entertainment industry, told through the epic story of Creative Artists Agency (CAA)—the ultimate power player that has represented the world's biggest stars and shaped the landscape of film, television, comedy, music, and sports. 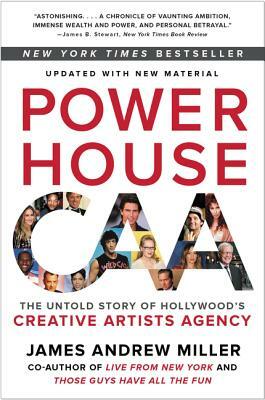 Started in 1975, when five bright and brash upstarts left creaky William Morris to form their own innovative talent agency, CAA would come to revolutionize Hollywood, representing everyone from Tom Cruise, Meryl Streep, Robert De Niro, and Steven Spielberg to Jennifer Lawrence, J.J. Abrams, Will Smith, and Brad Pitt. Over the next decades its tentacles would spread aggressively into sports, advertising, and digital media. Powerhouse is the fascinating, no-holds-barred saga of that ascent. Drawing on unprecedented and exclusive access to the men and women who built and battled with CAA—including co-founders Michael Ovitz and Ron Meyer and rivals like Ari Emanuel of William Morris Endeavor—as well as the stars themselves, Miller spins a unique and unforgettable tale of brilliance, ambition, betrayal, and outrageous success.